Today’s alphabet list of superfoods is brought to you by Lichi Super Fruit. When does a food go from basic food to a superfood? When it has a phytonutrient content value high enough to produce health benefits, of course! If you’re bored with the basics, take a look at this list of superfoods to get some ideas about what to pack in your next lunch. Bonus: Use it as a tool to teach your kiddos the alphabet. Multitasking, yay! A is for avocado. Creamy and delicious, avocados provide nearly 20 essential nutrients, including fiber, potassium, vitamin E, B-vitamins and folic acid. Providing the recommended amounts of both mono- and polyunsaturated fat, avocados keep your heart healthy and can actually lower bad cholesterol. B is for blueberries. Regarded as the hardest-working berry, blueberries deliver ample vitamins, minerals and antioxidants to the body and is believed to have cancer-fighting properties as well. Add fresh berries to your cereal or oatmeal, or make a blueberry smoothie with low-fat yogurt and ice. C is for coconuts. In the past, coconuts have received a bad rap for a rather high saturated-fat content. However, the tides have turned thanks to new research that shows that coconut is actually good for you. It has the ability to balance the body’s acidic levels and regulate the digestive system. You can use low-fat coconut milk when cooking or drink coconut water. D is for dates. Chewy and moist, dates help intestinal disorders, aiding in regularity. When dried, dates provide a rich amount of niacin, copper, iron, and magnesium, and fresh dates are full of vitamin C.
E is for eggs. Worthy of its reputation for being incredible, eggs keep you full for longer periods of time thanks to their high protein level. Eggs also play a vital role in brain function and eye health. F is for flaxseed. Extremely rich in Omega-3 fatty acids, flaxseed protects against heart disease, cancer, diabetes and bone loss. Available in whole, milled, ground or oil versions, flaxseed can easily be added to your diet. Try topping soups and salads with it, or mix it with oatmeal or yogurt. G is for goji berries. This bright-orange berry helps you stay fuller longer with its high amount of protein. Athletes snack on them between games because they provide ample fuel for their muscles. H is for honey. Don’t leave honey to the bees! This all-natural sweetener keeps glucose levels low and provides energy without the unwanted sugar spike. K is for kale. Considered to be the most nutritious leafy green in the produce aisle, kale provides a hearty dose of iron, calcium and fiber. It is also believed to fight off cancer thanks to its DNA-protecting properties and high amount of antioxidants. L is for lychee. Not only do lychees deliver high amounts of vitamin C and potassium, they also provide your body with essential antioxidants and minerals. Additionally, lychees are known to help burn visceral fat, due to their extremely high ORAC value, which aids in the oxidation of fat. M is for mangosteen. An exotic deep purple fruit, hailing from Indonesia, mangosteens are rich in xanothenes, which are believed to be the most potent antioxidant found in nature. Anti-inflammatory, antibiotic and anti viral, xanothenes provide a host of benefits from improving cardiovascular health, aiding in digestive regulation, and boosting immunity. O is for oranges. An excellent source of vitamin C, oranges boost your immune system and help your body fight off colds. They also play a role in neutralizing free radicals found in the body. P is for pumpkin. A fall favorite, pumpkin should be a part of your diet year-round as it helps keep your eyes and immune system healthy with its high amount of vitamin A, vitamin C, potassium, riboflavin and manganese. Q is for quinoa. A whole-grain seed known for its nutty flavor and texture, quinoa offers the most effective combination of protein and fiber that will keep hunger levels down. It’s also a good source of B vitamins, potassium and riboflavin. 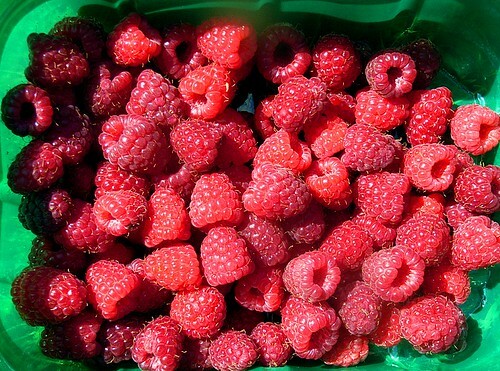 R is for raspberries. Raspberries are high in fiber, vitamin C and antioxidants, working hard to keep you regular and protect your body against free radical damage. S is for salmon. Fused with Omega-3 fatty acids, salmon helps to build muscle and keep your heart healthy. Stick with wild salmon as it has been raised in more humane conditions and has more developed muscles. T is for tomatoes. Found in tomatoes, lycopene is a carotenoid that protects your body’s cells from oxygen damage and helps your heart stay healthy. Most recently, studies have shown that lycopene has major cancer-prevention abilities, particularly when fighting against prostate, breast, pancreatic and intestinal cancers. W is for walnuts. Recent studies have shown that walnuts are the best nuts out there due to their high amount of antioxidants. Containing almost twice as many antioxidants as any other nut, walnuts can protect against heart disease, cancer, diabetes and other health problems. Y is for yogurt. A great source of calcium, yogurt helps to beat bloat and provides healthy bacteria for the gut. Keep a close eye on those sugar grams through; some yogurts contain more sugar than ice cream! Great List ErIn, I am also making some posts on Indian Superfoods and landed to your page. Great List.